Pink c/o Rire Boutique lace dress, Vintage Chanel pin, Arm candy: pink c/o JewelMint Abacus wrap bracelet, white F21 pyramid bracelet, Rings via Crossroads Trading, White vintage Chanel purse, Brown Zara ankle strap heels, Brown thrifted woven belt. Spring is fast approaching, when I know we have to "spring" forward our clocks..despite losing an hour of sleep, I'm really happy there's more light in the day. 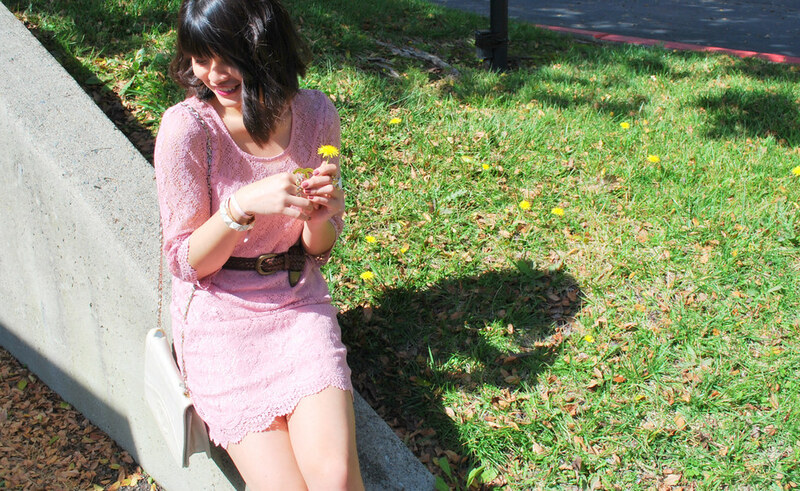 Enjoyed the sun this day with flowers -- went well with this sweet lace dress from Rire Boutique. I love the lace scallop hem detail. Played with pinks and brown neutral colors -- added my Zara heels and brown thrifted belt. Also for accessories used gold rings and bracelets. One bracelet in particular caught my eye from JewelMint, it was sweet and reminded me of those candy bracelets I used to wear when I was a kid. This week ahead hopefully will go by fast, on a personal note -- I'm thinking of going back to school for my MBA, I'm attending an info session this week at UC Berkeley, which would be my top choice. Wish me luck on the preparation! Sigh, not looking forward to more tests, but I know it'll be all worth it in the end :). Love the Chanel!! Great vintage find. Going back to school is always something I hope to do, so if you have the chance, take it! cute look! So delicate and feminine!! =) You wear this well! that dress is so sweet, you look lovely! Love this dress, it is so pretty on you!